Is Ambati Rayudu the solution to Team India's middle-order dilemma? Is he the righteous heir to the number 4 spot? Can he be the deciding factor in India's World Cup campaign? We discuss. Manish Pandey, Ajinkya Rahane, KL Rahul, Dinesh Karthik, Shreyas Iyer and MS Dhoni - all have one thing in common; they were all tried by India to fix their middle-order puzzle - the search for number four in the batting order. Replacing the likes of Rahul Dravid, Sourav Ganguly, VVS Laxman, Yuvraj Singh, Suresh Raina and the legendary Sachin Tendulkar - the occupants of this position for the most part of the last two decades - was never going to be easy. But what was even more surprising was the fact that a batsman-rich nation like India was struggling to find one such player for such a long time. With just about a dozen games to go before the ICC World Cup 2019, India on Monday found a suitable No.4 batsman at the Brabourne Cricket Stadium, Mumbai. 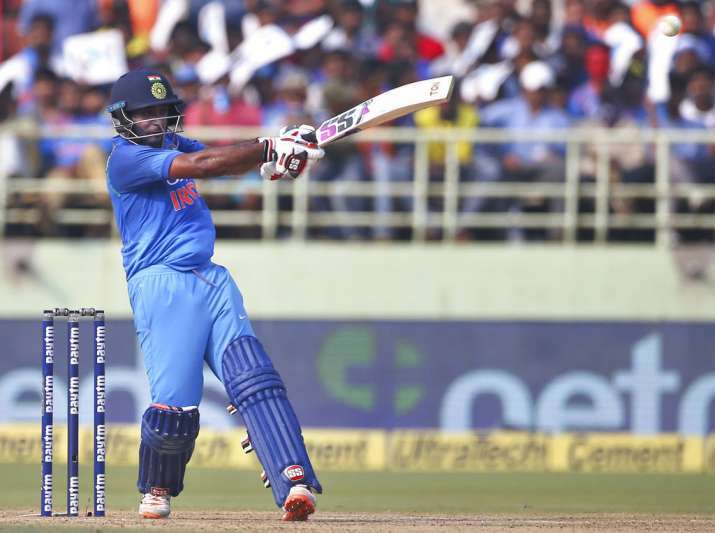 On a flat deck against a rejuvenated West Indies, Ambati Rayudu walked in with India at 101/2 in the 17th over. After the cheap dismissals of in-form Virat Kohli and opener Shikhar Dhawan, the responsibility fell upon two ex-IPL teammates - Rayudu and Rohit Sharma - to take India towards a match-winning total but sans the loss of wickets given the unpredictability of India's lower middle-order. Rohit, who was already past his half-century, was looking good at his home ground. Amid Rohit's blitzkrieg, all eyes were on the Andhra-based batsman and how he approaches his innings when he doesn't have a target to chase, neither a team in crisis. The crisis had already been handled well by Rayudu in conjunction with his captain two matches ago against the same opposition in Visakhapatnam. Then, India had lost both their openers at the score of 40. At the middle-order that hardly brought in any confidence before, the 73 (80) he scored ably supported a rampaging Kohli at the other end who seemed to be breaking records at will. At Brabourne though, Rayudu's job was to preserve his wicket as Rohit was already eyeing a big one. And that's what he did. 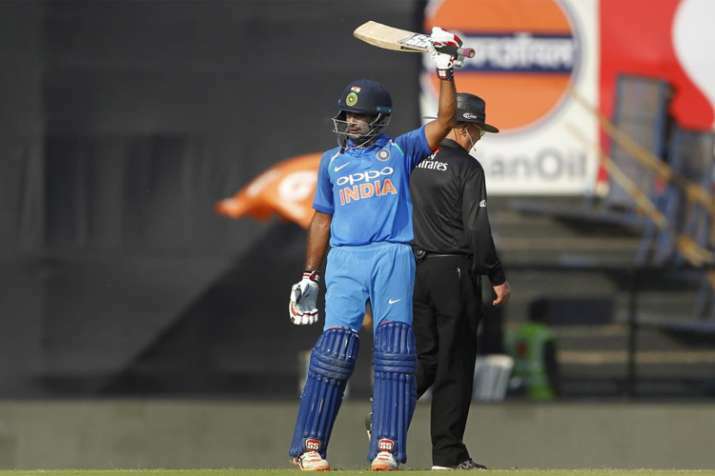 But after taking his time to settle in, Rayudu matched Rohit shot-for-shot and the way he handled the spinners was a beautiful sight to watch. When Nurse bowled full to him, he slog-swept him for boundaries, but when Marlon Samuels bowled wide of off-stump, Rayudu was quick on his feet to loft him over covers. Against the fast bowlers, he trusted the pitch's low bounce to hook and pull with aplomb, while occasionally scooping the ball over fine leg to get the same result. Eventually, he was run out just after completing a magnificent stroke-filled century. Incidentally, this was the first century from an India batsman outside the top-3 since January 2017. Not just this series, but also in the Asia Cup that was played just before the West Indies' arrival, Rayudu had fulfilled the role of a No.4 batsman to perfection - albeit he didn't get a lot of time in the middle in the UAE. In all, with a remarkable 100 off 81 balls, Rayudu seems to have made the position his own. Apart from impressive skills, the thing that worked in his favour is the confidence shown in his ability by the team and most importantly by captain Kohli. Before the start of the West Indies series, Kohli had openly expressed his support for Rayudu, saying: "The team felt there (at the Asia Cup) - and I also watched him -- that he (Rayudu) is designed to play that middle order batsman's role. We feel that our middle-order is more or less balanced now." The distinct thing that was noticeable about India's earlier experiments with the position, whether it be Rahane or Rahul, was that those batsmen seemed to have to tweak their natural game to suit the spot. But this doesn't seem to be the case with India's new no. 4. As he himself said before the Vizag ODI: "I don't think it's new to me because it's a position I've played a lot in and there's nothing new they've asked me to do. They've asked me to go out and play my game". Isn't that exactly what we want from a player playing in any position? To know the responsibilities and have the natural game to suit it. That's exactly what Kohli thought too, isn't it! However, it shouldn't be forgotten that Rayudu's career was all but over when he joined the rebel Indian Cricket League (ICL) in 2009 after being ignored for selection. His career got a fresh lease of life in 2009 when he got an amnesty from the BCCI and returned to the domestic setup. Since then, Rayudu hasn't looked back and has consistently been making runs in first-class cricket and the IPL. He has scored close to 300 runs in every single edition of the IPL, barring the 2017 season in which he missed a number of games due to a groin tear. As if to compensate for last year's disappointment, Rayudu hit 605 runs in IPL 2018 alone forcing the selectors to take notice. Grant Elliott. Do you remember him? After having made his debut in 2008 for New Zealand, Elliott impressed with his temperament at the international level. But he couldn't really fill the shoes of retired all-rounder Jacob Oram and was subsequently dropped from the side. At 34, however, fortune favoured him when he earned a surprise recall to the Kiwis' ODI side. He immediately made an impact propelling them to a historic series win in South Africa. Still, he played a monumental role in his penultimate year of international cricket when in inarguably his country's greatest chapter in its cricket history, he guided them to their maiden World Cup final in 2015 after memorably hitting Dale Steyn for a match-winning six in the semis. At 33, Rayudu doesn't look like a long-term prospect for India, but Elliott's case is a prime example that at times age just doesn't matter. With the World Cup approaching, it wouldn't hurt India's chances if Rayudu were to take a leaf out of Elliott's book. After all, however short the Kiwi's career might have been, the image of him depositing Steyn over the long-on boundary is still etched into the minds of all cricket lovers. Rayudu now has the chance to do something similar. Will he, or won't he? We will get the answer in England next year. One thing is clear - the questions regarding the No.4 spot have now earned a well-deserved rest.